and on our local radio station Môn FM. and The North Wales News Chronicle. 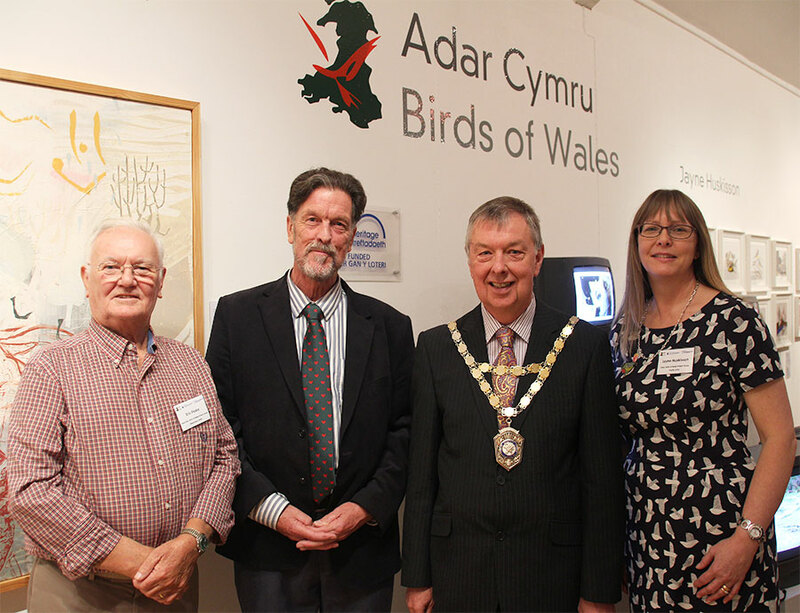 The Birds of Wales exhibition opened on Saturday 16th September with a queue of people from the gallery door down to the main entrance and with record numbers of over 250 attending – more than gallery staff can ever remember being at any previous opening. Mr Nick Jackson MBE, Director of The Welsh Mountain Zoo – National Zoo of Wales opened the exhibition, with Mr Albert Owen MP and Mr Dylan Rees, The Mayor of Llangefni also in attendance. The exhibition has 250 pieces of fine and applied art by 18 selected artists from across Wales each portraying The Birds of Wales in their own unique way. It was a wonderful day with an amazing amount of positive feedback. We are quite literally blown away by the enthusiastic response to the project. 32 events and activities are planned during the 51 days of the exhibition, all supported by a Sharing Heritage Grant from The National Lottery. One month to go before opening day . . .
We have been really busy preparing for the exhibition. Here are a few things that we’ve been up to . . .
Tweeting our news to the Valley branch of U3A. We had a lovely warm welcome and are looking forward to showing them around the exhibition in October. More talks are planned to groups in the local area over the next month. Collecting and judging all of the beautiful entries from local school children for the Art and Poetry competitions. We have had an amazing 456 entries! The 3 winners from each category will be announced at the start of the new schoolterm with an invitation to the Awards Ceremony on 24th September at Oriel Ynys Môn. The children’s work will be displayed for the duration of the exhibition in the Main Gallery. Working closely with Oriel Ynys Môn planning and designing the children’s activity booklet for the exhibition. Creating Bird Fact posters featuring bird sketches from Tunnicliffe’s archive and interesting facts about 6 specially selected birds seen on or close to the Isle of Anglesey. Filming at several bird reserves looking at habitats on Anglesey. These short films will be shown as part of the exhibition on a multi-screen display in the Main Gallery. Finalising Artist’s Statements and lists of artwork for the exhibition to be submitted to Oriel Ynys Môn for translation, formatting and printing. We have also been busy advertising the project far and wide . . .
We awaiting the very exciting and imminent arrival of the September issues of Welsh Coastal Life and Welsh Border Life magazines hot off the press featuring the project and advertising our exhibition. Invitation cards to the opening have been designed and printed ready to be delivered and emailed out. Posters, Activity booklets and leaflets are being distributed. Our Social media campaign on Facebook and Twitter is on-going so please like us and share and retweet our posts as we countdown to the big day! An important date for your diary - Saturday 16th September, 12noon is the official opening of the Birds of Wales exhibition at Oriel Ynys Môn by Mr Nick Jackson MBE, Director The Welsh Mountain Zoo – National Zoo of Wales. Everyone is welcome! Charles Frederick Tunnicliffe was one of the United Kingdom’s leading wildlife artists who spent the majority of his artistic years at Shorelands in Malltraeth on the Isle of Anglesey, so it was entirely fitting and appropriate to both stage the “Birds of Wales by Artists of Wales” exhibition on Anglesey and also to include some of his work in the exhibition. 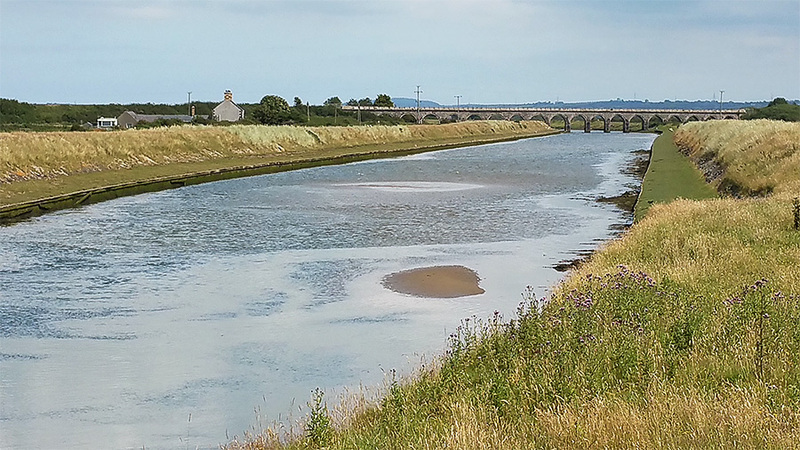 Indeed, the Tunnicliffe archive collection is held by Oriel Ynys Môn, having been bequeathed to the Isle of Anglesey County Council on the condition that it was housed together and made available for public viewing. The archive collection includes many of Tunnicliffe’s exquisite measured drawings, referred to by him as 'feather maps', which are annotated with extensive notes including specific locations in Wales where the birds were sighted or found. His meticulous rendering of both anatomical and feather formation show years of dedication, commitment and passion to his art. Links to the heritage of Tunnicliffe will feature throughout the duration of the main exhibition, specifically through a number of talks by bird-related charities and The Tunnicliffe Society and with opportunities for “Behind the Scenes Tours” of the Tunnicliffe archive. It was from the archive collection that a number of pieces were selected to hang in the “Birds of Wales” exhibition in the Main Gallery. The opportunity was also afforded to select complementary work to be displayed in the Tunnicliffe Gallery at Oriel Ynys Môn for a parallel exhibition. 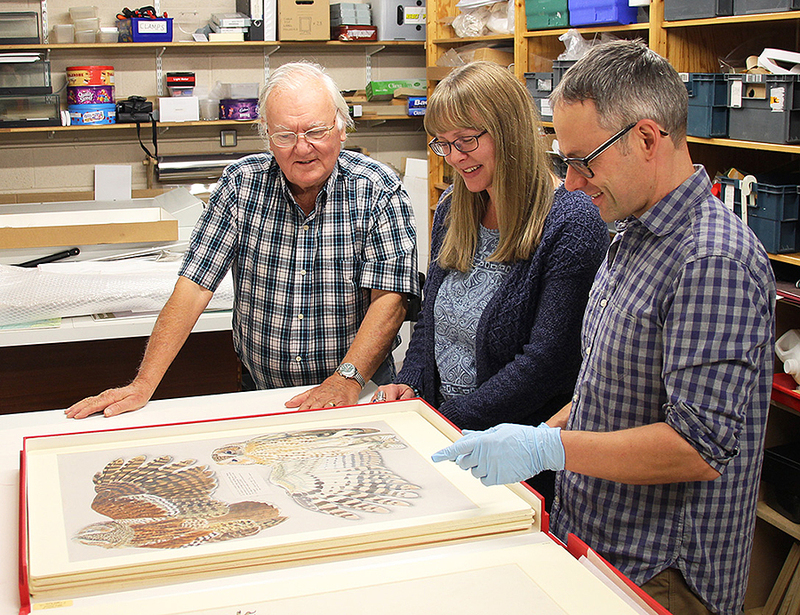 Eric Peake and Jayne Huskisson with Ian Jones (Collections and Buildings Manager, Oriel Ynys Môn). We are delighted to have begun to share our love of birds with the wider community of Anglesey and North Wales over the last few weeks. The Birds of Wales Project has reached the local press with articles in the Holyhead and Anglesy Mail, Bangor and Anglesey Mail and The North Wales Chronicle. Menai Holiday Cottages have featured the Project in their brochure, "The Handbook", for all things beautiful to see and do in North Wales. 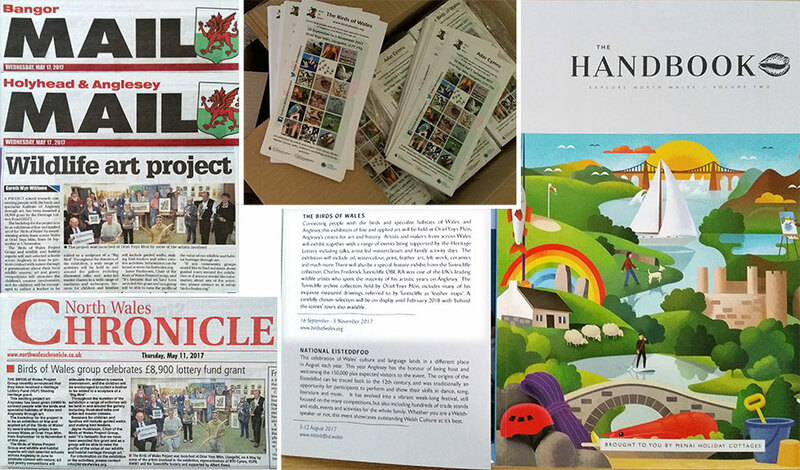 The Birds of Wales Project bilingual Leaflets and Activity Booklets have arrived from our local printer, Vinyls4u, and are being distributed widely. The Booklets have information about the many artist-led master classes, bird-specialist talks, children's workshops and family activity days supporting our art exhibition at Oriel Ynys Môn. We are visiting community groups giving presentations about the project and talking about some of the RSPB and NWWT bird reserves on Anglesey and across Wales. We are also running a social media campaign, showcasing each artist and advertising all of the events and activities. Please "Like" us on Facebook @birdsofwalesproject and "Follow" us on Twitter @birdswalesproj and share our posts with your friends. 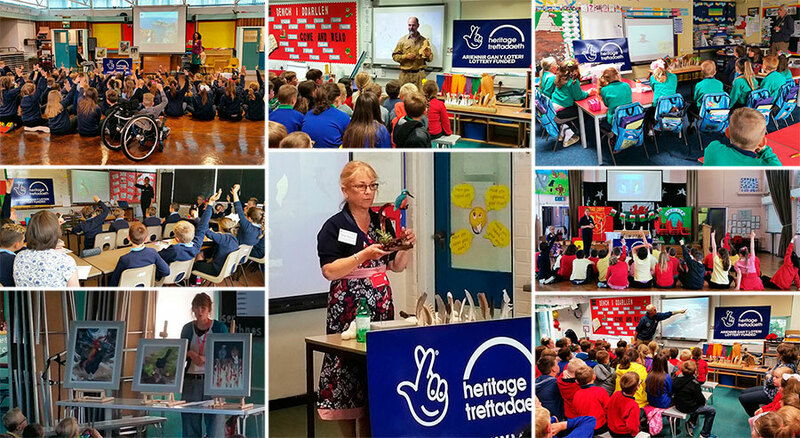 Over the last few weeks Jayne Huskisson, along with a ‘bird specialist’ and an exhibiting artist, has been visiting primary schools that are near to bird reserves on Anglesey. Laura Kudelska from RSPB South Stack Cliffs, Ben Stammers from The North Wales Wildlife Trust and Caroline Bateson from Anglesey Wildlife Walks talked to the children about the birds they might see at nearby bird reserves and explained about the different habitats in which they live. Duncan Kitson, Anwen Roberts and Eileen Williams, all artists involved with The Birds of Wales Project, were there to inspire the children by showing them examples of their artwork and explaining how they had been made. The children were invited to take part in Art and Poetry Competitions with birds as the theme. There are 3 age categories; Years 1 & 2, Years 3 & 4, and Years 5 & 6 with prizes for 1st, 2nd and 3rd in each competition and age category. 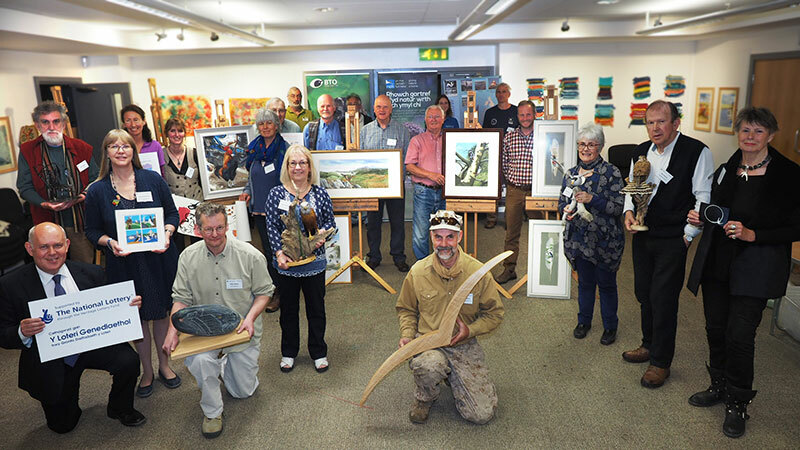 All of the prize-winning entries will be exhibited at Oriel Ynys Môn as part of The Birds of Wales Exhibition. The schools have all been invited to bring the children to Oriel Ynys Môn in October to see both The Birds of Wales Exhibition in the Main Gallery and selected work from the Charles Tunnicliffe archive in the ‘Feather Map of Wales’ Exhibition in the Tunnicliffe Gallery. The children were also encouraged to collect feathers found on the ground in Wales. These will be added to a sculpture of a ‘BIG BIRD’ created by artist Anwen Roberts. This too will be exhibited during The Birds of Wales Exhibition. We were all met with such enthusiasm and the children had lots of interesting questions and they were very keen to learn. They are all looking forward to taking part in the activities which are a key element of The Birds of Wales Project and to visiting Oriel Ynys Môn. So exciting at last to finally share the news about our project. It’s been 4 years in the making since Eric asked Jayne to work with him to build an exhibition of bird artwork. This original concept very quickly grew once they realised this would be a fantastic opportunity to connect people with the birds and specialist habitats of Anglesey and Wales through art, with the project now encompassing an exhibition of mixed-media artwork at Oriel Ynys Môn by makers and artists from across Wales with supporting artist-led masterclasses, bird-specialist talks, children’s workshops and family activities. A lot of work and planning has gone into the project so far. Just like a bird takes a long time to build a nest with great care taken choosing the right materials - twigs carefully selected are placed by design and leaves and feathers are found and woven through - so we have been building our team and ‘The Birds of Wales’ project. The team, or to give us our official title ‘The Birds of Wales Project Delivery Group’ are led by textile artist Jayne Huskisson www.angleseytextileart.co.uk. Working closely with Jayne is Vice-Chair, Eric Peake watercolour artist www.ericpeake.co.uk; Secretary, Anwen Roberts oil artist www.anwenrobertsart.co.uk and Egryn Huskisson Treasurer for the project. Supporting us with the project is Eileen Williams felt artist @littlecraftsneedlefelting, Caroline Bateson www.angleseywildlifewalks.com and Emma Huskisson our Youth Representative. 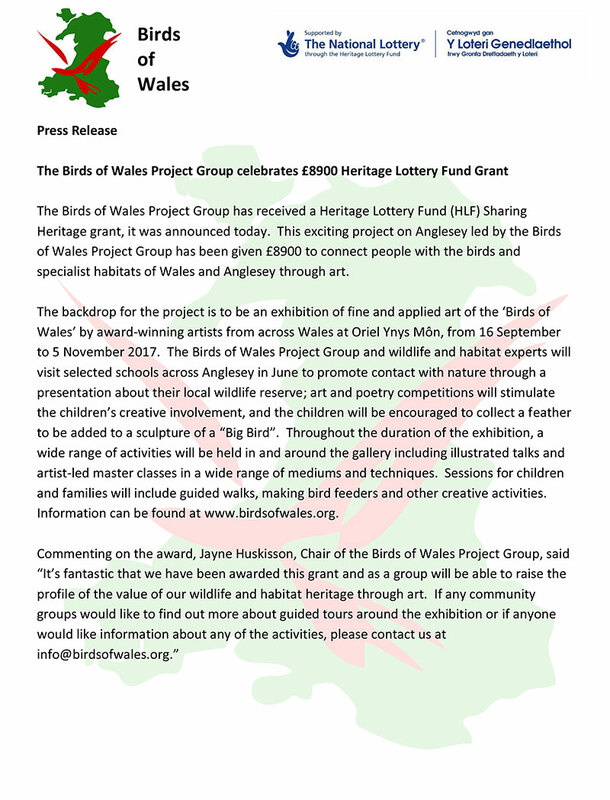 Without the support and dedication of the team working together this project would simply not have flapped its wings but it is a Sharing Heritage Grant from The Heritage Lottery with money raised by National Lottery players that has enabled The Birds of Wales Project to really take flight. 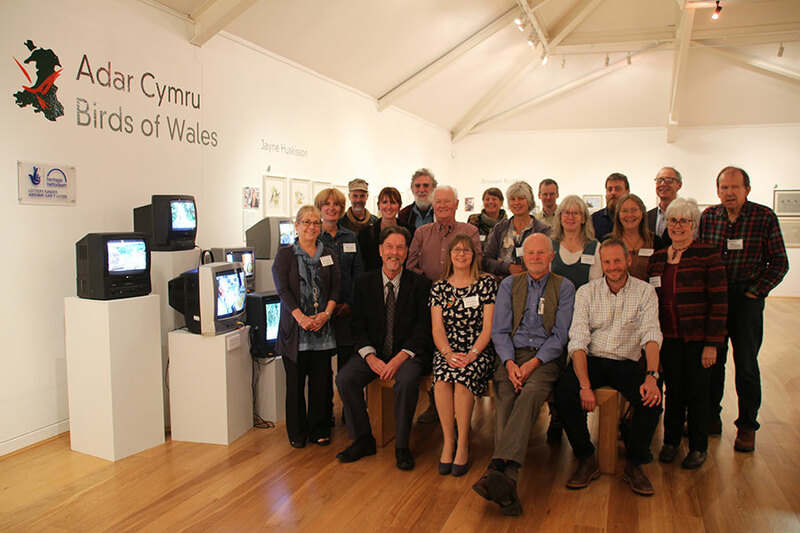 On 4th May 2017 it was fantastic to bring together so many of the exhibiting artists and representatives of the participating organisations for the project's Media Photocall at Oriel Ynys Môn.